What are they teaching them?? A friend bought a reading book for his young son the other day. Highly commendable! I approve. But when he showed it to me, I was unexpectedly horrified. The first page introduced the characters, by showing them all in a line with their names underneath them. You can find the same characters here, as it’s also been made into a television series. Mum and Dad – seems perfectly reasonable. No problems there. Then Biff. Now that seemed odd to me, for lots of reasons. For a start, Biff had long hair in a ponytail, which says to my simple mind that Biff is a girl. The text confirms this assumption. But I thought Biff was a boy’s name. It certainly is in Back To The Future, and the Hardy Boys books. A quick wikipedia search for the name Biff shows a reasonable list of people, and crucially all of them seem to be male. But that’s not all – most of them are also American, so I assumed that this must be an American book. We move on. The next character is Chip, Biff’s brother. Well, that clinches it – it must be an American book. Then the final child in the family, Kipper. No, hold on, Kipper must be the dog’s name. No, the dog is called Floppy. So the family called their youngest child Kipper. That’s not American – it’s just NUTS! Then I discover that the book isn’t American at all, it’s published by the Oxford Univerity Press. So what are they trying to teach our children? Apparently Biff and Chip are twins. Friends of mine had twins recently, and I gave them many helpful suggestions for twin names, – Zig and Zag (which is beautifully simple), Laurel and Hardy (which works very well – Laurel is a nice name for a girl, and Hardy has just the right amount of upper-class twittery to make it a fashionable boy’s name in these troubled times in which we live), Lilo and Stitch, Shrek and Donkey (or, I suppose Fiona). But none of these suggestions are as silly as Biff and Chips. Especially if Biff is a girl. 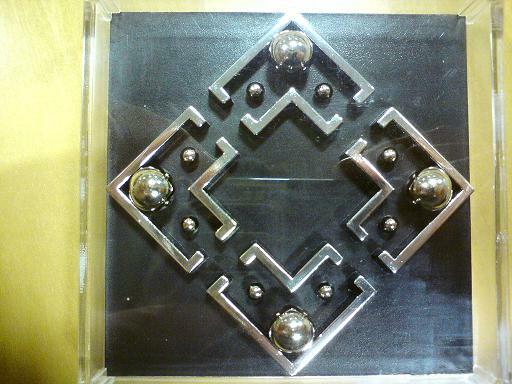 What kind of person leaves one of those impossible infuriating puzzles with the little balls and holes on your desk? I mean, what kind of mental cruelty is that? Is sabotaging my day in work the sort of baheviour that made this nation great? Well, I managed to solve it anyway! See! See! I did it! 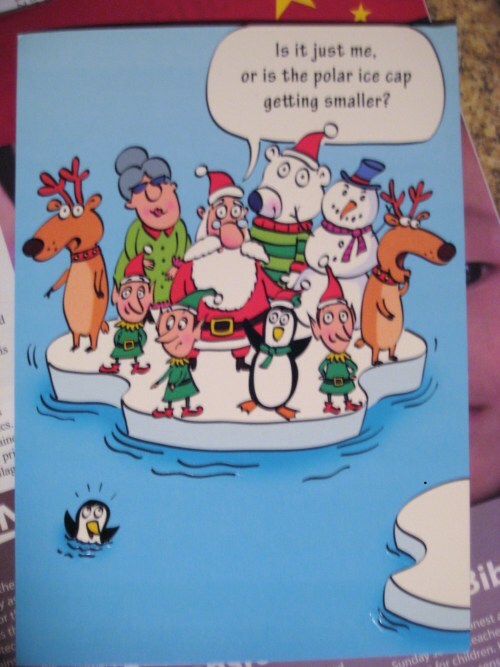 I’ve finally taken down all my Christmas cards, and done a complex analysis, and decided that the Christmas Card of the year is this one, from my cousin Mark. Apologies to all the artistic and crafty people who sent me hand-made cards. They were very nice, and appreciated, but the comedy and controversy value of this one wins. You are currently browsing the Destroy All Onions! blog archives for January, 2009.